My son is 15 and this year he gave up on playing football to be in the marching band. We have never seen him have such a good time and be so talkative! He had a parade today and before I even read the challenge thread today, I KNEW the color would be purple. Unfortunately I forgot to take my camera to the parade! It made it out to the garage, but was still sitting where I put it down when I drove in after the parade!!! He was kind enought to pose for me and I actually caught a SMILE! It's amazing! Great to hear he's happy in his pursuits! Great grungy look to the LO and his smile is so big! Aww as a for color guard captain I say WTG!!! to your son!!!! How nice to of him to pose for you!! I like the musical notes on the bg paper or overlay. This is one happy young man! That's so good to see! I really like how you've introduced the musical aspect to your LO through your backgrounds - and how you've made his handsome smile stand out by framing just his upper body! Wonderful job- and congrats on the happy teenager!! He's very handsome! And purpule suits him! The page is great (as is the smile)! TFS! Great LO. You showcase your son beautifully and I love the "musical" feel of the layout. That's a great pic of your handsome son! I love the grungy and musical feel to this. 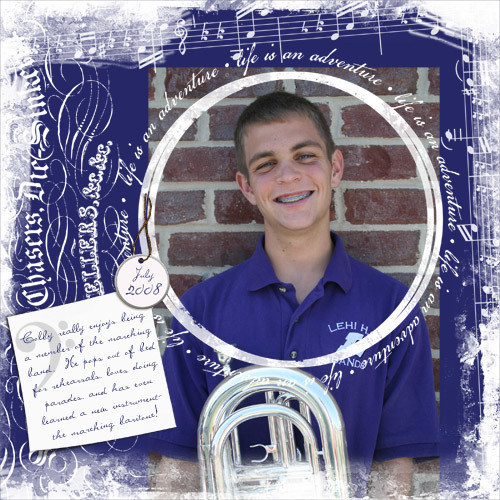 It's perfect for a musically-inclined young man! Great LO! How FUN! and I love the grungy look of the layout. Love the musical brushwork at the edges. Fine job! Good for him that he's found something he obviously loves and can get excited about...great LO even if you didn't get the actual parade pics. That's a wonderful photo! I'm so glad he's doing something he loves. I love the background with the lines of music. Thanks for joining the challenge!